Being a big fan of Mexican food, I’m always looking for ways to simplify or improve my favorite dishes. 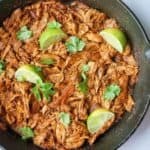 Mexican Shredded Chicken has been a favorite of mine for years, but it can be quite hard to make at home as it takes a long time to allow the spices to penetrate the chicken. A workaround for this is to just throw everything into a crock pot and leave it alone all day. While that’s good, I wasn’t in the mood to settle for good on this particular day. I wanted great. This recipe for Mexican Shredded Chicken is just that! Your two options are breasts or thighs. If you’re eating a keto diet and trying to get as much fat as possible, this an easy choice. We’re going with thighs. Thighs contain much more fat than chicken breasts which are nearly fat-free. I always opt for bone-in cuts when possible as the flavor is just so much better. The first step here is to heat a cast iron skillet on medium heat. You can use any kind of skillet you want, we’re not putting this in the oven, so cast iron isn’t required. Once the pan is up to temperature, add some ghee to it and place the chicken thighs in. They don’t need to cook through, we’re just looking for a bit of color on both sides. These will cook for two hours total, so them being under-cooked isn’t a concern of ours. We like to buy skin on chicken thighs and use the skin to make these incredible Skin-ny Chicken Dippers. This is where all the flavor is, so of course it’s the key component of making a delicious batch of Mexican shredded chicken. Most of the ingredients are what you would expect, but there is one ingredient that takes this sauce to the next level that you may have to go out and get. It’s Chipotle peppers in Adobo sauce! These guys have a great depth of flavor and are exactly what you’re looking for to give this chicken the Mexican authenticity it needs. I pick these peppers up from my local grocery store in the Ethnic/World foods isle. The brand I used is Goya. Here’s a link to the peppers for reference. Adobo sauce has some sugar in it, but don’t worry too much, we’re only using a few peppers per batch. The rest of the ingredients are all relatively common for any home cook. The full ingredient list is shown at the end of this post. The preparation of the sauce is simple. Throw everything in a blender, add some water and blend until liquid. When the chicken is browned to your liking, add the sauce directly to the pan on top of the thighs. From this point, we will be cooking on medium heat for 90 minutes while the thighs are whole. Flip the thighs periodically. I flipped them four times over the course of the 90 minutes. During this time you also need to keep an eye on the water level. When the sauce gets reduced down just add more water to it and allow it to reduce again. I like to aim to keep the water level over halfway up the chicken. After 90 minutes, shred the chicken off of the bone and cook for 30 more minutes. I use tongs and a fork to shred the chicken while it is still in the pan cooking. If you have trouble doing that, or if it doesn’t come off the bone as easy as you’d like, there is no problem with taking the chicken out for a few minutes and allowing it to cool, shredding it, and then throwing it back in the sauce to cook further. The chicken is already fully cooked at this point. The remaining cook time is just to get the sauce to flavor the chicken as much as possible. After the Mexican shredded chicken has been cooking in the sauce for 30 minutes, allow the sauce to reduce all the way down. You can speed up this process by turning the heat up, or just let nature take its course. Keep an eye on it when it starts getting close to being fully reduced. If you go too far the sauce will burn quite rapidly. Once the sauce is reduced to your liking, you’re ready to dig in. Cilantro and lime juice go great with this Mexican shredded chicken. If you’re looking for recipes to use this authentic Mexican shredded chicken in, try our fathead empanadas! Heat a skillet on medium heat. We used a cast iron skillet but any type if skillet will do. This dish does not go in the oven. Heat 1 tbsp of ghee in the skillet. Add chicken thighs once ghee is up to temperature. Lightly brown each side of the thighs. In a blender combine Chipotle peppers in Adobo sauce, salt, oregano, cumin, cayenne pepper, shallot, garlic, lime juice and 2 cups of water. Blend until liquid. Once chicken is browned to your liking, add sauce into the skillet over top of all the chicken thighs. Cook for 90 minutes, flipping chicken periodically. When the sauce reduces down, continue to add water to restore it to it's previous volume. Cook the shredded chicken for 30 minutes. After 30 minutes allow the sauce to fully reduce down 1 last time. Keep an eye on it as it will burn if it reduces too much. Garnish with lime and cilantro and enjoy!